WASHINGTON, D.C., July 20, 2006 (LifeSiteNews.com) – San Diego’s Mount Soledad cross may continue to stand in its place over the city, after the House passed a bill Wednesday to protect the war memorial by transferring the land beneath the cross into federal hands. House members voted 349-74 to take possession of the cross by giving the land on which it stands to the Defense Department, Copley News Service reported. This would protect the memorial from a court-ordered removal. 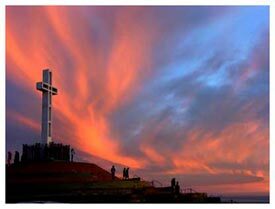 The battle over the Mount Soledad cross has been in the courts since atheist resident Phillip Paulsen, backed by the American Civil Liberties Union, sued the city in 1989 for displaying a religious symbol on public land. In 1991, U.S. District Court Judge Gordon Thompson Jr. ordered the city of San Diego to remove the cross, saying the cross violated the separation of church and state under the state constitution. Residents and officials of San Diego fought the ruling, trying to convince the city to voluntarily donate the land to the federal government. When the city refused, local residents rallied to protect the historic monument, gathering more than 100,000 signatures on petitions in support of transferring the cross to federal possession. After years of legal wrangling, Judge Thompson finally issued an order in May 2006, forcing the city to remove the cross by August 1 or pay fines of $5,000 per day. The U.S. Supreme Court temporarily blocked that order on July 3, after the Thomas More Law Center filed an emergency application for stay on behalf of San Diegans. The Thomas More Law Center is a national public interest law firm based in Ann Arbor, Michigan. Now, with the House vote in place to protect the cross, supporters have new hope for the survival of the monument. A similar bill to protect the cross has been introduced in the Senate, and President George Bush has indicated he will sign it if the Senate passes the measure. The 43-foot cross has stood at the center of a national veterans memorial on the top of Mt. Soledad since 1954, when it was built to replace a previous cross dating back to 1913.